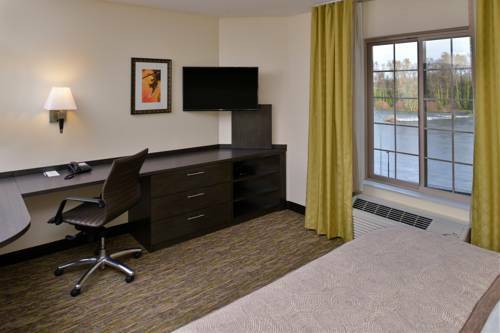 Welcome to the Candlewood Suites Eugene & Springfield Hotel located on the Willamette River! Eugene & Springfields Candlewood Suites is located directly across from the Willamette River Walk Bike Path and is located just minutes away from I-5, HWY 58, HWY 126, Downtown Eugene and The University of Oregon and is located directly on the EMX Line which means that easy transportation to anywhere in Eugene and Springfield is footsteps away. Business travelers will benefit from the proximity of our Candlewood Suites hotel to many nearby companies including University of Oregon, Willamette McKenzie Medical Center, Peterson Cat, Kingsford Charcoal, and International Paper. Our non-smoking Candlewood Suites on the River hotel offers easy access to attractions including the University of Oregon's Hayward Field, Matthew Knight Arena, Autzen Stadium, Cascades Raptor Center, Mount Pisgah Arboretum and Willamalane Sports Center. Hotel guests can enjoy a plethora of amenities including Family Friendly accommodations, on site Candlewood Cupboard and kitchens in every room. Guests can also experience our onsite health club fully equipped with state of the art equipment designed with your health and wellness in mind. Laurelwood Golf CourseLaurelwood Golf Course is a regulation 9-hole facility. The hilly terrain and beautiful scenery make for a challenging game and peaceful walk. The mid-summer speed of these greens will give even the professional golfer a run for their money.